Bruce: When I was younger, women used to throw themselves at my feet all the time. Bruce: I stepped over them. Batman Beyond began with a simple premise: Batman as a teenager. As described by the producers on one of this set's extras (Inside Batman Beyond), Warner Brothers was looking for a way to bring a slightly younger audience into the Batman franchise. The creators behind the Batman and Superman Animated Series' genuinely disliked the idea of having Bruce Wayne flitting around Gotham as a happy-go-lucky kid, so they took the concept in a whole new direction: toward the future. Fifty years from now, an elderly Wayne (still voiced by the great Kevin Conroy) reluctantly hands over the Batman legacy to high-schooler Terry McGinnis, who uses his high-tech suit of Batman armor to defend Gotham City from all manner of criminals, with his irritable mentor watching over him from the batcave. The concept has no business working, but in taking Terry seriously and making him a tragic, but still rounded and interesting character, Bruce Timm, Paul Dini and company succeeded once again in creating an animated series that really does play to grown-ups as well as kids. And while the series stays true to the darkness of its predecessor (though adding a future-cool aesthetic drenched in reds), Terry gets to have a lot more fun than the old man was ever allowed. In this final season, Terry begins to step from the master's shadow and come into his own. On the whole, the season's episodes aren't the most inspired of the series' run, largely following a villain-of-the-week format. Slippery baddie Inque returns, along with Kobra, Big Time, and the Zeta robot from the previous season. It's not such a bad thing, though: the guys in charge knew what they were doing by this point, and even middling Batman Beyond is better than watchable. Somewhat disappointingly, there's no genuine series conclusion here. As the producers explain in one of the extras, the economics of daytime cartoons are such that there's a huge lag between creating the last show and knowing for certain that it's the last show. Batman Beyond reached the requisite number of episodes for syndication, and that was that. The final episode, "Unmasked", involves a flashback to a kid who was given a glimpse of Terry's real identity and was put in harm's way because of it, but fans craving closure will have to catch the direct-to-DVD Return of the Joker, as well as the Justice League Unlimited episode "Epilogue." This may be the last season, but Terry's story doesn't end here. There are several standouts: The first episode of the two-parter "The Curse of Kobra" sends Terry back into training where he befriends a sheltered young warrior who develops an unhealthy fixation on Terry's friend Max (the conclusion, unfortunately, tosses the characters aside for a weird action plot about dinosaur men). "Inqueling" teams the titular villain up with her untrustworthy and credit-challenged daughter. Message? Pay your bills, kids. There are also a couple of fun nods to the past: Bruce's old flame Talia (daughter of the terrorist Ra's al Ghul) shows up with a tempting offer of eternal youth in "Out of the Past," while an aging Superman calls upon Terry to take a spot on the Justice League Unlimited of the future. The catch is, Leaguers are dropping like flies, and Terry has to track down the culprit before the traitor claims any more victims. It's a neat way to suggest that Terry's growing up, and includes a few spectacular action set pieces. It's also the first time that so many heroes team up in any of these shows, and would pave the way for the Justice League series. For fans of the whole DC-comic-book-animated universe that Warner Brothers brought about, that team-up alone would be worth the price of admission. Even without it, though, and even if it's not the best season, this is a solid set of concluding episodes from a surprisingly great series. Image Transfer Review: There's a bit of fine grain in spots, but for the most part the transfer is smooth and crisp. Audio Transfer Review: Nothing overly fancy in the Dolby 2.0 mix, but it is modestly dynamic nevertheless. A bit more directionality might have been nice for an action show like this, but I had no major complaints other than that. Extras Review: The two extras on this set will be familiar to those who have purchased other "DC Comics Classic Collection Discs. 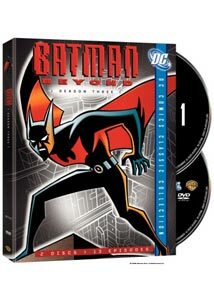 Included on Disc 1 is: Inside Batman Beyond Season 3, in which the producers discuss the highlights and a few candid lowlights of the season. These panel discussions are broad-ranging, and the producers are likeable and enthusiastic. Disc 2 includes a similar extra: Closeup on.... Producers, directors and actor Will Friedle discuss several episodes of the season individually. A bit like commentary tracks, and playable individually or via "play all". It's not the best season of Batman Beyond, but the show manages to go out with a great deal of style (though you'll have to pick up Justice League Unlimited: Season One for Terry McGinnis' real swan-song). Though nothing fancy, the special features are generous in run-time and thorough. Fans won't be disappointed.